The GNYC Academy for Transition Professionals launched in Spring 2012 (click here for the Academy’s promotional flyer). The Academy consisted of a 5-day workshop series developed by program staff in CUNY’s College Now and Collaborative Programs Research & Evaluation Unit to help program providers from area community-based organizations to systematically analyze their own program designs and learn how to best use data to inform their program practices. 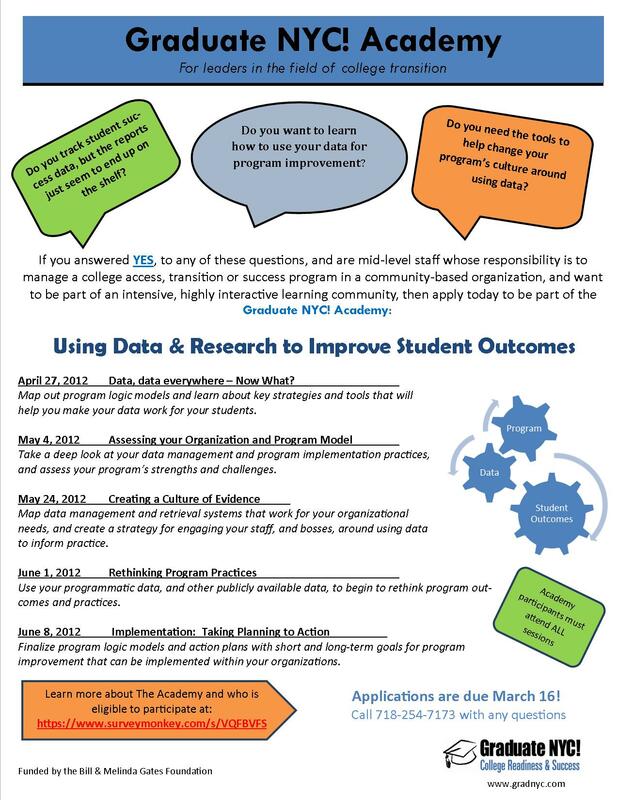 The workshop series was designed to provide participants with the opportunity to explore the wide range of data, whether collected by the program or publicly available, that can be used to help inform program practices and report on program outcomes. During the Spring 2012 workshop series, Academy participants framed their program components, using program management tools like logic models and backwards mapping techniques, to identify and quantify tangible organizational goals and outcomes. Click here for the Academy Training Manual, which contains information and strategies for data-informed program management practices, and provides copies (or links) to all of the references and material shared during the workshop series.